Surveyor and cadastral map of Orange County, Florida, which included present-day Seminole County. This map was created by a Swedish immigrant, J. Otto. Fries, in 1890. Coming to America in 1874, Fries was a respected civil engineer that later attended the University of Florida. He was hired by Orange County to create this surveyor’s map with all of its distinct features. This map is very special because of two unique characteristics. Firstly, it is a topographical and a cadastral map, showing the physical features and real estate of the area. Secondly, this map includes local family names on the location of their residence, something that is quite rare for public maps. Also, this map shows Orange County before it was split into two different counties: Seminole County and Orange County. This map was kept in the Seminole County Courthouse in Sanford until 1913. In 1954, the map was given as a gift from Jack Fox to Arthur Beckwith. From there, it was donated to the Museum of Seminole County History by Arthur Beckwith, where it has undergone extensive restoration to fix the discoloration, peeling edges, and ripped pieces. Original 56.75 x 42.5 inch color map by J. Otto Fries, 1890: E. W. Smith & Company: Philadelphia, 1890: Museum of Seminole County History, Sanford, Florida. Digital reproduction of 56.75 x 42.5 inch color map by J. Otto Fries, 1890: E. W. Smith & Company: Philadelphia, 1890. Originally created by J. Otto Fries and published by the E.W. Smith & Company. "Orange County Government." Orange County Government. http://www.ocfl.net/. "Seminole County Government." Seminole County Government. http://www.seminolecountyfl.gov/index.aspx. "Museum of Seminole County History." Seminole County Government. http://www.seminolecountyfl.gov/departments-services/leisure-services/parks-recreation/museum-of-seminole-county-history/. Blackman, William Fremont. History of Orange County, Florida; Narrative and Biographical. Chuluota, Fla: Mickler House, 1973. Howard, Clarence E. Early Settlers of Orange County, Florida: Reminiscent-Historic-Biographic. Orlando, Fla: C.E. Howard, 1915. Fries, J. Otto. 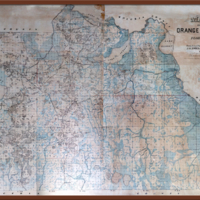 “Map of Orange County, Florida, 1890.” RICHES of Central Florida accessed April 22, 2019, https://richesmi.cah.ucf.edu/omeka/items/show/1671.